After rising for the past 10 trading days, the Dow ended modestly lower Friday following a surprise drop in a measure of consumer confidence. The Dow Jones industrial average fell 0.2%, ending the longest winning streak since 1996. The S&P 500 fell 0.2% after coming within two points of its October 2007 record high on Thursday. The Nasdaq lost 0.3%. All three indexes ended higher for the week, and are up between 7% and 11% for the year. The last time the Dow had such a string of gains, then Federal Reserve chairman Alan Greenspan warned that investors were experiencing "irrational exuberance." "The optimism we've seen for stocks suggests that expectations are very high," said Bruce McCain, chief investment strategist at Key Private Bank. "And reality often doesn't live up to that level of perfection." Still, he said a correction in stock prices would be healthy, creating opportunities for new investors to push the market higher in the second half of the year. Stocks have been supported by better-than-expected economic data and signs the Federal Reserve will keep its stimulus policies in place. But there are concerns that growth in emerging markets, such as China, is beginning to "roll over," said McCain. Meanwhile, data released Friday painted a mixed picture for the U.S. economy. The Thomson Reuters/University of Michigan index of consumer sentiment for March unexpectedly fell, raising worries about the impact of higher income tax rates on household spending. The index was at its lowest level in 15 months, driven by a "combination of the payroll tax hike and rising gasoline prices," said Amna Asaf, an economist at Capital Economics in Toronto. Earlier in the day, the U.S. Bureau of Labor Statistics said the consumer price index rose 0.7% last month, driven mainly by a spike in energy prices. CPI was expected to have risen 0.5%, according to a Briefing.com consensus. But the annual inflation rate is still just 2%, within the range that the Federal Reserve finds to be comfortable. Separately, industrial production rose more than expected in February, after being flat in the prior month, according to the Fed. Bank stocks were in focus after the Federal Reserve on Thursday approved the capital plans submitted by 16 of the 18 banks it subjected to stress tests. 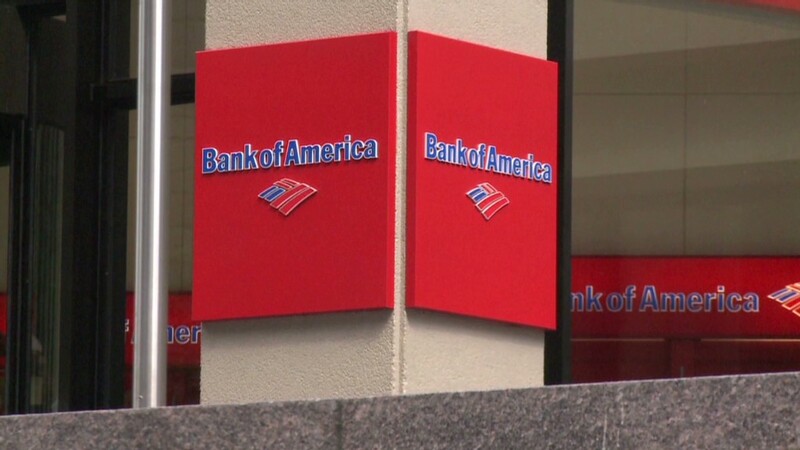 Bank of America (BAC) shares rose after it announced plans to repurchase $10.5 billion of common stock and preferred shares. Wells Fargo (WFC) said it would increase its quarterly dividend payment to 30 cents per share, starting in the second quarter. J.P. Morgan Chase (JPM) and Goldman Sachs (GS) both dipped after the Fed approved their capital plans, but with conditions attached. Shares BB&T Corp (BBT), one of only two banks to have its capital plans rejected, also fell. Separately, the Senate issued a scathing report late Thursday, accusing JPMorgan of intentionally misleading investors about the so-called London Whale trades, which ultimately led to losses of $6 billion for the bank. Former chief investment officer Ina Drew and other executives testified before a Senate panel Friday. Shares of Carnival Cruise Lines (CCL) fell after another of its ships experienced technical difficulties, the latest in a growing list of woes for the company. Carnival also reported earnings that widely missed estimates, and issued a weak outlook. The Securities and Exchange Commission said two units of the hedge fund SAC Capital agreed to pay a record $619 million in fines to settle insider trading charges. Friday was the last day to close out certain options, known as "quadruple witching," which is when four types of contracts expire -- those tied to market index futures, market index options, stock options and stock futures. European markets ended lower. European Union officials agreed Friday to give Portugal more time to meet targets for reducing its debt. Oil and gold prices both edged higher as the U.S. dollar weakened. 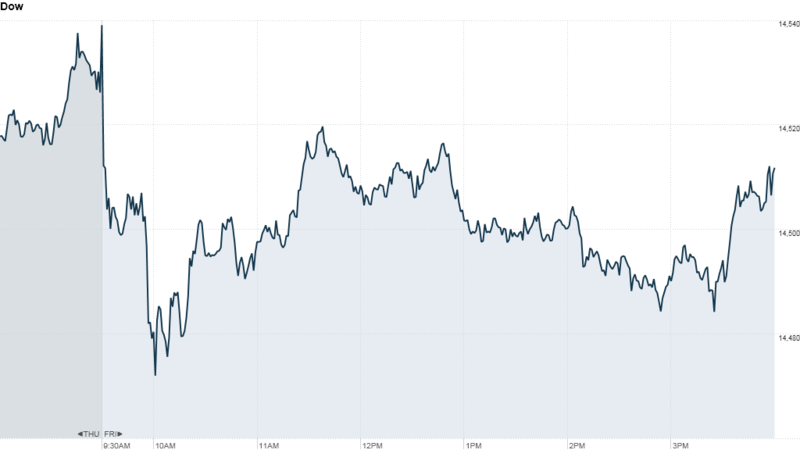 The yield on the 10-year U.S. Treasury note dipped to 2%.